The gas-tight door of the Kanada I delousing gas chamber. Its construction by the DAW, is very rudimentary. 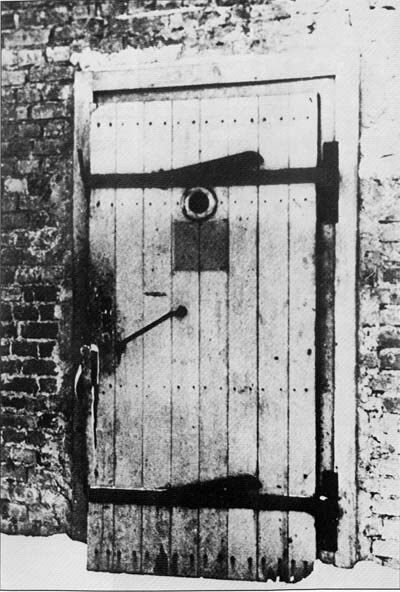 It has a peephole, a handle to open it and two hinged iron bars [latches with handles] to close it, closing being completed by screwing a right-angled bolt through each of the two metal catches into which the latches were fitted.This type of gas-tight door, with the same method of closing, was to be used as it stood in the homicidal gas chambers. 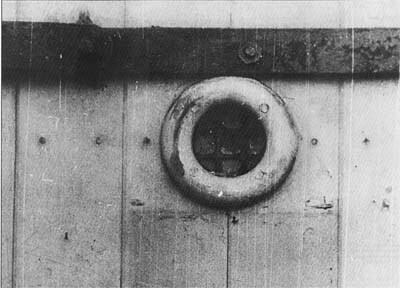 Close-up of the peephole of the same gas-tight door. This “historic” montage is to he compared with that mentioned in the postface with reference to the Krematorium of K.L. Natsweiler in Alsace.